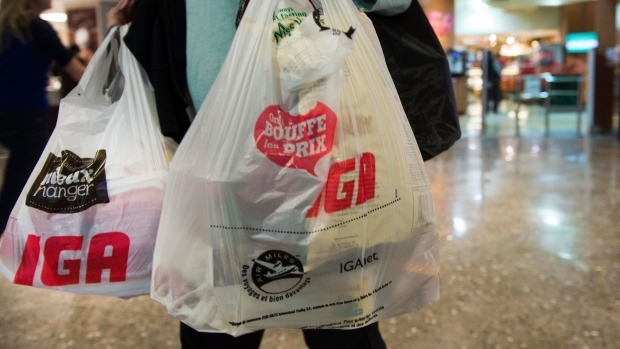 Brossard, Que., passed a bylaw as expected on Tuesday to ban the use of single-use plastic shopping bags in the Montreal suburb as of Sept.
Other plastic bags, such as those containing dry cleaning, food sold in bulk, and flyers distributed door-to-door will still be allowed. The bylaw was adopted by the Brossard council despite a legal letter the community received on Feb. 11 from the Canadian Plastic Bag Association demanding it back down. The association called for consultations, suggesting the bylaw is "abusive and unreasonable," is based on faulty information and doesn't consider the negative impacts of a ban. Shopping-bag detractors, however, say they are a source of pollution, end up in landfills and take a long time to decompose. Brossard is one of at least five smaller Canadian municipalities that have instituted similar bans.